Why is this cucumber here? I wanted to see if you were afraid of it. Why would I be afraid of a vegetable? That’s a very good question. I just thought I’d give it a try. The internet is full of videos of cats jumping up and running out of the room when they are startled by a cucumber. That makes no sense. It’s a vegetable. What’s the science here? 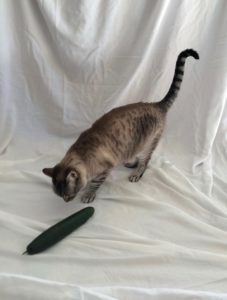 Why is a cucumber supposed to scare a cat? That’s a very good question. One theory is that it looks like a snake. Seriously???? A snake? Look at that thing. There is absolutely nothing snake-like about it. I can’t believe people are thinking such nonsense. You are absolutely right. What can I say. Humans are not always scientifically rigorous. So, I’m a little surprised that you tried to startle me with a vegetable. Okay, okay, I have to say I’m really embarrassed now that I tried this. You can’t believe everything you see on the interwebs. I know, honey. Don’t rub it in. We agree, Mia. It is a little strange. I, for example, love to play with green beans!